Mash the bananas with the nut/seed butter until combined. Add in the rolled oats. Mix until evenly combined. Shape tablespoons of the mixture into a biscuit or bar shape and place on an oven tray. Bake for 20 (ish) minutes until golden brown and fragrant. 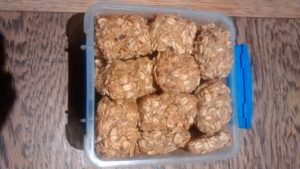 NB: This recipe is a GREAT base to work from for a more elaborate muesli bar recipe. For example, before adding in the rolled oats with the bananas, you can mix them with some seeds, dried fruit and/or chocolate pieces. Yup, it’s that simple! 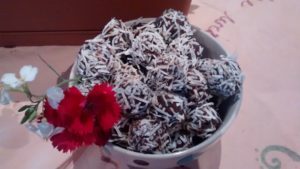 The next recipe (below) is a slightly more elaborate one we’ve developed from this simple recipe. This is a SUPER SLAPDASH recipe, so do feel free to alter and change around quantities if you wish. The consistencies will vary somewhat, depending on the fruit you use and how juicy they are – so don’t be scared to stray from the recipe a bit. Note that you can get away with a sludgier consistency than you might expect because the refrigeration step does solidify the mixture a bit, making it easier to work with before you put it in the oven. The recipe can be refined sugar free, so long as the dried fruit you use has no added sugar, and so long as you choose a syrup that isn’t golden syrup! A cup worth of mashed up fruit. We usually use only one type of fruit, but you can mix and match fruit types until you get a cup worth if you want to. If you are working with one type of fruit, a cup worth is usually about 2 bananas or 3 medium apples or 3 plums or 3 medium pears. OPTIONAL: 2-3 tablespoons of sugar (can use coconut sugar) – not necessary if the fruit you use is banana, but can be good for fruit like apples or pears which aren’t super sweet. Put the cut fruit, syrup, nuts or nut butter (and sugar, if using) in a food processor and blend until combined (a few chunks are OK). If you are using bananas as your fruit of choice and nut butter rather than whole nuts, then you can probably get away with not pulling out the food processor and instead just mash everything together in a bowl with a fork! Mix together the oats, seeds, chia/flaxseeds, and dried fruit in a mixing bowl and then add in your fruit/syrup/nut mixture. Stir all the ingredients together until combined and a consistent mixture is formed. OPTIONAL – refrigerate for at least 30 minutes (the mixture is quite wet so this step makes it easier to mould, but is not really necessary). When you are ready to start forming the bars, preheat the oven to 180oC. Put the bars in the oven for about 20-30 minutes (keeping an eye on them). You want them to come out lightly golden and a nice brown patch on the bottom. Sesame seeds or extra shredded coconut for rolling/coating. Soak dates in a bowl of boiling water for at least 20 minutes. Drain the dates (you can conserve the soaking water for baking as it’s lovely and sweet), and then add them to the food processor. Add in all the other ingredients to the food processor, except for the sesame seeds or additional shredded coconut for rolling. Blend until the mixture becomes smooth and consistent (you’ll probably need to stop the blender occasionally and scrape down the sides). You may wish to add small additional amounts of some of the ingredients to get the taste and texture you prefer. Once mixture is processed, you can form it into balls (you choose the size). For those that value efficiency, did you know that you can roll two at a time? Just put two splodges of the mixture in your hand – one in your palm and one half-way up your fingers – and roll them simultaneously. Amazing! 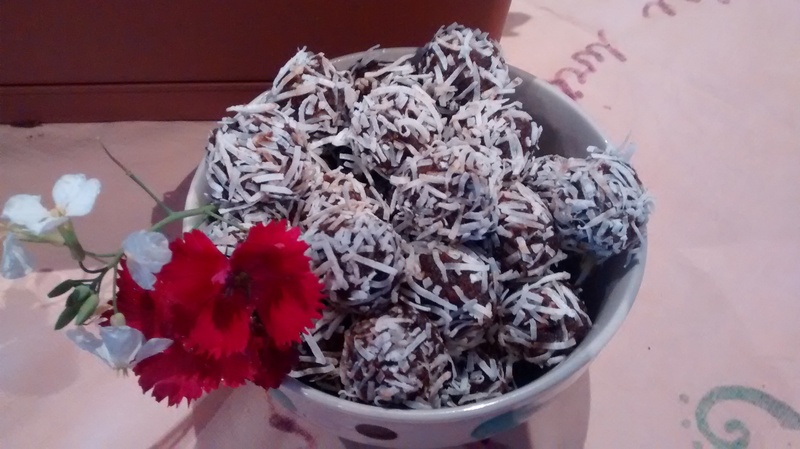 (Thanks to Raviv, a professional chef, for mercifully intervening one evening when we were making these bliss balls super inefficiently, one at a time, and showing us that there is a faster way, haha). 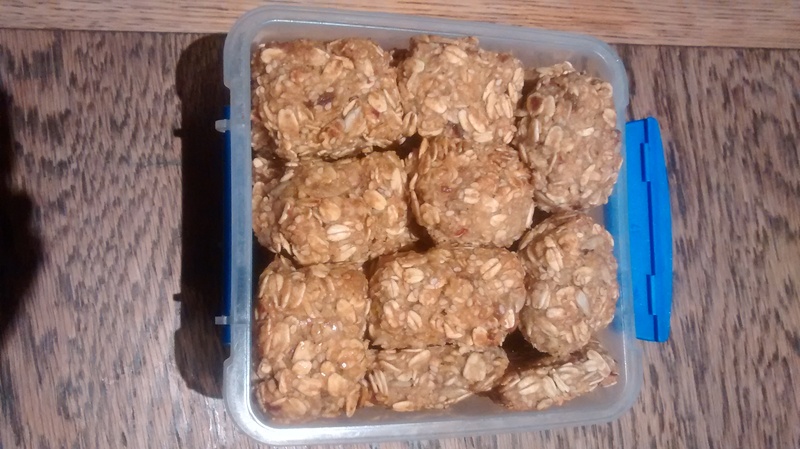 Place the balls in a container and keep refrigerated until ready to eat. Put your rice krispies and/or buckwheat groats in a bowl. Heat the nut/seed butter and the syrup together in a pan on the stove top, stirring constantly, until combined. Add the nut/seed butter-syrup mixture to the rice krispies/buckwheat groats, mixing around until evenly distributed. Now, either pour mixture onto a clean glass chopping board, a glass oven tray/dish or a porcelain oven dish OR line any baking dish with Trade Aid’s home compostable chocolate wrappers (which we wash and conserve before composting for uses such as this!). Press the mixture down firmly into one big, even cake, to the height that you would like your bars to be. Pop in the fridge for at least 30 minutes to set. When set, take the set rice krispie/buckwheat groat cake out of the dish and chop into the size bars you like. If you used Trade Aid’s chocolate wrappers, this task will be easier, but if you didn’t, this is why we recommended the glass tray, or the glass or porcelain oven dish because the rice krispie cake will stick to these less and you can use a metal spatula to get the bars out. Remember, though, that if the big piece of sticky rice krispie cake does disintegrate a little bit as you lever it out with a spatula, it really doesn’t matter as you can stick it back together when you are cutting the bars and they’ll reset once returned to the fridge! Store the bars in an airtight container in the fridge so that they maintain their shape (we stack the bars in a Tupperware and put a Trade Aid chocolate wrapper in between each layer so that they don’t stick to one another). NB: we keep this recipe zero waste by NOT using single-use baking paper/parchment paper. Instead, we use Trade Aid’s home compostable chocolate wrappers because we buy this chocolate occasionally (because the packaging is compostable in our home compost), but rather than eating the chocolate and then putting the wrapper straight into our compost bin, we see the value in keeping, washing, and reusing the wrapper first (especially because the wrapper is FREE, unlike baking paper…) And it’s great to use instead of baking paper in instances like this when you aren’t going to bake the stuff (not sure the Trade Aid wrappers would hold up to baking) – thanks to our friend Ismene for this top tip! Having said all that though, a metal spatula on a glass or porcelain oven dish is also a fine alternative and will get the rice krispie/buckwheat groat cake out for slicing. Many thanks for your wonderful recipes. I know how delicious they are as I tasted every delicious treat you brought to Ashhurst last year. I’m very interested in your opinions about coconut oil – could you please enlighten us? Our approach to avoiding coconut oil (and in fact many oils) is partly related to zero waste and partly non-zero waste related. From the zero waste perspective, it’s really hard to find satisfactory refill options for oil because so much oil is imported. Bulk coconut oil usually comes in large plastic tubs, so there’s a bunch of plastic that comes with it. Furthermore as we do not grow coconut in NZ, coconut oil has to be imported, which means more waste – extra packaging on the shelves, but also behind the scenes getting the stuff to NZ. Our compromise is to get Trade Aid’s glass jars of coconut oil, which are great jars for upcycling, but there’s a limit to how many of these glass jars we need, so we do try to reduce how many purchase. We find that if we only use the coconut oil for our toiletries, we only need one jar a year for the two of us. Other bulk oils tend to come from overseas in plastic that is not recyclable/reusable. So we look out for bulk oil that is NZ oil that have been provided to retailers by the local manufacturers/growers in refillable/reusable metal dispensers. This happens in some parts of the country (for example, Nelson, Tasman and Marlborough have heaps of local oil on tap all over the place). But in many parts of the country this is still not an option, so we get around this by trying to share and use recipes that require minimal or little oil. Anyway, our non-zero-waste related reasons… first, it’s a taste thing. We just don’t like the taste of coconut oil. We use coconut oil for our toothpaste, so honestly when we eat something with coconut oil, it just tastes like toothpaste to us, so not very yum, ha! Second, we also do not feel good after eating food with high quantities of coconut oil in them, it just makes us feel nauseous (for this reason we are not a big fan of a lot of those raw vegan places) – some people feel great after eating coconut oil, so this is a personal thing. Third, we generally don’t cook with refined oil where we don’t think it’s necessary (just like we don’t cook with refined sugar or extra salt if we don’t think it’s necessary) – we’ve found that most recipes simply don’t need oil and that often people use oil simply out of habit (some recipes, like crackers, need a bit of oil for texture and so we use oil, but as you’ll note, at least one of our cracker recipes doesn’t need any refined oil at all and they’re delicious). Coconut oil is a refined oil/saturated fat and we personally don’t see why we would put slabs of saturated fat into our food if we don’t feel it tastes nice or if we don’t feel it adds anything to the recipe. Our perspective on refined oil has been shaped by the research of doctors Caldwell Esselstyn and Dean Ornish (among others) – but there are certainly other people/researchers who disagree and take a different stance and cite coconut oil/saturated fats as healthy. Ultimately, we eat this way and are happy eating this way and it works for us. Everybody is different so if it doesn’t work for others, by all means, adapt our recipes to include coconut oil – we really don’t mind how people adapt our recipes so long as it’s low-waste!! Thanks Julie – and all the best for Back to Basics!